Google’s latest attempt to bring the social networking side of Google+ into relevancy was revealed yesterday with updated search functionality that now allows user to search for hashtag terms in Google’s search engine. The catch is that these results displayed are only being pulled from Google+ posts that are thematically relevant to the hashtag being queried, in a bid to continue to bring prominence and visibility to the social network. The section is broken up into three parts. The first section is a link to the hashtag. This will bring users to Google+ and present the public “best of” postings for this term. The second section provides actual posts. These posts are culled from the above mentioned “best of” page and can be cycled through manually by the up and down arrows. A small sampling of different hashtag searches indicates that Google is currently limiting the number of posts to cycle through to six. Clicking any of the posts will bring the user to that post, albeit via the “best of” page rather than the status owner’s page. The third section is a set of links pointing to Twitter and Facebook pages showcasing those social networks’ posts that contain the hashtag. For Google+ users that want to get in on this action, the good news is that these results are linked to the Google+ hashtag system, where Google+ is already appending topic hashtags to posts based on the text content whether the user actually uses the hashtags or not. You’ll notice in the example above, neither post actually contains the hashtag “#avengers”. 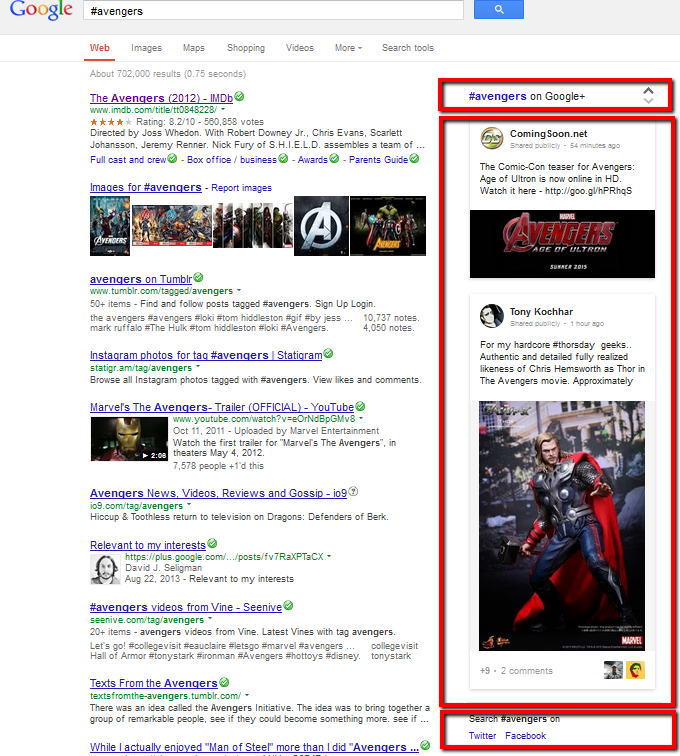 Instead, Google+ has automatically appended the hashtag to the post based on the naturally used work “Avengers” within the post. While you can rely on Google+ to add their own hashtags based on thematic relevancy your posts, users who want to target specific terms should still manually apply hashtags to their updates. It will be interesting to see if this brings any additional value to Google+ and to brands that have made hashtags part of their overall marketing campaign. Obviously, Google seems to think so, though this will require users to be trained to search for hashtag terms in Google itself, rather than just clicking the hashtag or searching for a hashtag directly within their social networks of choice.